UNIVERSITY PARK, Pa. —Four pesticides commonly used on crops kill honeybee larvae, according to Penn State and University of Florida researchers. The researchers also found that N-methyl-2-pyrolidone (NMP), an inactive chemical used as a pesticide additive, is also toxic to honeybee larvae. Fluvalinate: also known as Apistan, Klartan and Minadox. Coumaphos: A pesticide used to control Varroa mites in honeybee colonies, also known as Meldane, Asunthol, Azunthol, Muscatox or Agridip. Chlorothalonil: A broad spectrum fungicide, pesticide and acaricide, also known as Bravo or Daconil. Chlorpyrifos: A pesticide most commonly used on cotton, corn and almonds. Brand names include Brodan, Dowco 179, Dursban, Empire and Scout. The study looked at how the pesticides interacted with eachother in the hive, rather than how toxic they were individually. Frazier said pesticide safety is judged on adult honeybee sensitivity to individual pesticides, not combinations of pesticides. According to Frazier, the team’s previous research demonstrated that forager bees bring back to the hive an average of six different pesticides on the pollen they collect. Nurse bees use this pollen to make beebread, which they then feed to honeybee larvae. To examine the effects of four common pesticides on bee larvae, the researchers reared honeybee larvae in their laboratory. They then applied the pesticides alone and in all combinations to the beebread to determine whether these insecticides and fungicides act alone or in concert to create a toxic environment for honeybee growth and development. “We found that mixtures of pesticides can have greater consequences for larval toxicity than one would expect from individual pesticides,” Frazier said. 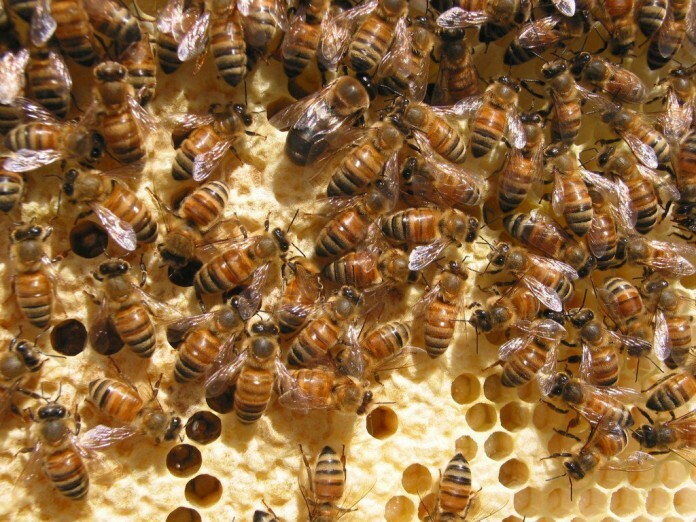 Among the four pesticides, honeybee larvae were most sensitive to chlorothalonil. They also were negatively affected by a mixture of chlorothalonil with fluvalinate. In addition, the larvae were sensitive to the combination of chlorothalonil with the miticide coumaphos. In contrast, the addition of coumaphos significantly reduced the toxicity of the fluvalinate and chlorothalonil mixture. The team’s results are reported in the current issue of PLoS ONE. “Chronic exposure to pesticides during the early life stage of honeybees may contribute to their inadequate nutrition or direct poisoning with a resulting impact on the survival and development of the entire bee brood,” he said. The researchers also investigated the effects of NMP on honeybee larvae by adding seven concentrations of the chemical to a pollen-derived, royal jelly diet. NMP is used to dissolve pesticides into formulations that then allow the active ingredients to spread and penetrate the plant or animal surfaces onto which they are applied. The team found that increasing amounts of NMP corresponded to increased larval mortality, even at the lowest concentration tested. “There is a growing body of research that has reported a wide range of adverse effects of inactive ingredients to human health, including enhancing pesticide toxicities across the nervous, cardiovascular, respiratory and hormone systems,” Mullin said. “The bulk of synthetic organic chemicals used and released into U.S. environments are formulation ingredients like NMP, which are generally recognized as safe. They have no mandated limits on their use and their residues remain unmonitored. Other authors on the paper include Wanyi Zhu, graduate research assistant in entomology, Penn State, and Daniel Schmehl, postdoctoral associate in entomology and nematology, University of Florida. The National Honey Board, the U.S. Department of Agriculture-National Institute of Food and Agriculture-Agriculture and Food Research Initiative-Coordinated Agricultural Projects and the Foundational Award programs funded this research. Editor’s note: This original article was written by Sara LaJeunesse. It has been edited and formatted for use on our website.